This aerial view of the countryside south of Banda Aceh, Sumatra, shows the devastation left in the wake of the tsunami and earthquake that struck the area on Dec. 26, 2004. The tsunami was the sixth worst natural disaster when ranked according to deaths per million. Amartya Sen won the Nobel Prize in economics in 1998 with the observation that there has never been a famine in a nation that has a democratic form of government and a free press. A similar relationship exists for natural disasters: Deaths associated with natural disasters are lower for nations with democratic forms of government and the associated higher national income, or Gross Domestic Product (GDP). In general, the World Bank’s Democracy Index, a measure of how strong a democracy is, and a nation’s GDP are stronger predictors of a natural disaster’s humanitarian impact (as measured by deaths) than either the size of the event or the population density in the area of the disaster. Global increases in democracy and GDP may therefore partially explain the apparent paradox of the generally decreasing death toll associated with natural disasters despite the increased population density in high-risk areas. Natural disasters result from encounters between natural events and human infrastructure and activity. It is logical, therefore, that the rapid global increase in human population should place more people in the path of natural events, raising both the number of natural disasters and their accompanying death tolls. In addition, climate change, sea-level rise and other environmental phenomena may be increasing both the severity and frequency of events such as floods, hurricanes and other extreme weather that can result in natural disasters. 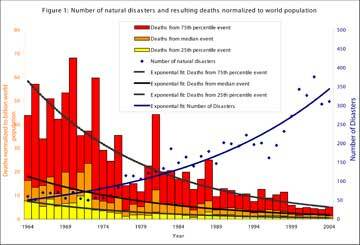 A historical comparison of annual natural disaster occurrences and disaster-related deaths, however, is inconsistent with the assumed relationship. Despite the increase in natural disasters, reported deaths are actually decreasing — both as a percentage of global population and in total numbers. The average annual percentage of the global population killed by natural disasters decreased 10-fold from the period 1964 to 1968 compared with the period 2000 through 2004, from 0.01 percent (roughly one killed for every 10,000 people) to 0.001 percent (one in 100,000) respectively. At the same time, the average annual number of recorded disasters increased five-fold between 1964 through 1968 (64 per year) and 2000 through 2004 (332 per year). 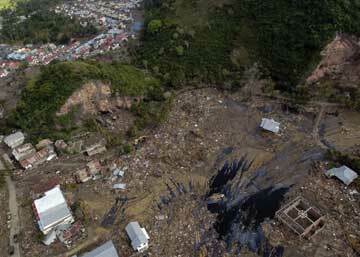 The events that continue to result in the major number of fatalities are the relatively small percentage of events that occur with large recurrence intervals, such as massive floods, strong earthquakes and direct strikes from intense hurricanes, or events that are unusual in the area in which they occur. Clearly, the impact of a natural disaster is not simply a function of the natural event itself, but is determined also by society’s ability to respond to the disaster. Over the same time period that we observe a decreasing number of disaster deaths, two great global socioeconomic trends of the last half century have also occurred: democratization and economic development. To evaluate the role that democracy and economic development play in reducing the humanitarian impact of natural disasters, we measured 133 countries’ natural disaster death tolls against both their average democracy ranking and their average per capita GDP. We excluded only those nations with a population of fewer than 1 million people, or which have experienced five or fewer disasters between 1964 and 2004. More than 80 percent of the total global disaster deaths from 1964 to 2004 occurred in just 15 countries, including China, Ethiopia, Sudan, Indonesia and Bangladesh, among others. Of these fifteen nations, 73 percent are below the median global GDP and 87 percent are below the median democracy index. The democracy index is the average of the World Bank’s Worldwide Governance Indicator values for voice and accountability, political stability, absence of violence, government effectiveness, regulatory quality, rule of law and control of corruption. 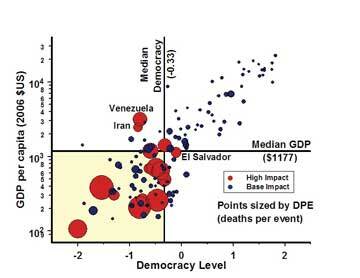 The exceptions to the trend that high GDP correlates with a low death toll after a natural disaster are Iran and Venezuela, both oil-rich countries with significant wealth but low democracy indices. Because the two outliers have high GDP and relatively high death tolls, they suggest that democracy, rather than GDP, may play the more pivotal role in reducing deaths from natural disasters. The strong exponential correlation between democracy and GDP, however, makes it difficult to differentiate the two. El Salvador also stands out as an outlier. Despite its democratic ranking, the impoverished nation experiences a large number of deaths in the aftermath of a natural disaster. El Salvador does not have a very high democracy rating (-0.1) in general compared to the global median (-0.3). (By contrast, the U.S. democracy index is 1.4, and Finland, which has the world’s highest democracy index, is 2.47.) In fact, El Salvador’s democracy ranking may be misleading in the context of this analysis. Its democratic constitution was drafted only in 1983, after a long period of political instability and civil war. Two common characteristics are notable in the countries in which the deadliest disasters have occurred since 1964. First, they all were (and many still are) developing nations: All except one (Peru) had a per capita GDP of less than $1,000 (U.S.) at the time of the disaster. Second, they were (again, many still are) non-democratic states: All except one (India) had a non-representative government or was at war (1965) when the disaster occurred, and India was facing a virtual war against militant Islamists. Notably, the type of disaster (including earthquakes, storms and floods, for example) varies among the top 10, again implying that the characteristics of the disaster itself count for much less than the characteristics of the nation. The two unifying traits of the nations with the deadliest disasters or, more exactly, the two qualities distinctly lacking in these nations, are democracy and development. Flooding in Nepal from last summer’s monsoons killed hundreds and left millions across Southeast Asia homeless. 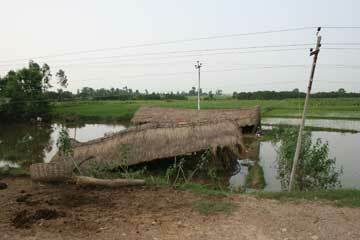 Regions such as Nepal’s Bardiya District in the southwest were particularly hard hit. New research indicates that countries with lower per capita GDP and a lower democracy index are more likely to face a lot of deaths when a disaster strikes than richer countries with stronger democracies. In contrast, the three costliest disasters occurred in countries that are highly developed and highly democratic — the 1995 Kobe earthquake in Japan, 2005’s Hurricane Katrina in the United States and an earthquake in southern Italy in 1980. However, the three costliest disasters resulted in a relatively miniscule number of deaths. The dichotomy is striking: Natural disasters that occur in undeveloped, non-democratic nations result in a high humanitarian cost but a low economic cost, whereas natural disasters that occur in developed, democratic nations result in a low humanitarian cost but a high economic cost. There is clearly a link between democracy, development and the impact of natural disasters. The strong exponential correlation between democracy and GDP makes it difficult to resolve the determining factor. In addition, the reason for the strong correlation between the World Bank’s Democracy Index and per capita GDP is not fully known. Similarly, it is difficult to determine exactly which of the factors that go into the calculation of the World Bank’s Democracy Index have the greatest influence in determining the relationship to the death toll. These considerations are beyond the resolution of our analysis. What is clear, however, is that the death tolls associated with natural disasters are undeniably linked to level of democratic rule within the nation that the disaster occurs. The relationship between the humanitarian impact of a natural disaster and the democracy of the nation in which the disaster occurs is consistent with the relationship that Amartya Sen discovered between democracy and famine. Deaths from natural disasters are more likely to occur in nations with low levels of democratic rule. Furthermore, we also calculated the pattern of humanitarian relief aid from both the Office of U.S. Foreign Disaster Assistance (OFDA) — the U.S. Agency for International Development’s disaster assistance department — and the U.N. World Food Programme: The analysis indicates that the populations of less democratic nations are more vulnerable to natural disasters. Of the 577 World Food Programme grants awarded between 1987 and 2004, 92.5 percent were given to nations with negative democracy values. Only 12 countries with positive democracy values received aid, and only one (Botswana) had a democracy value greater than 0.5. 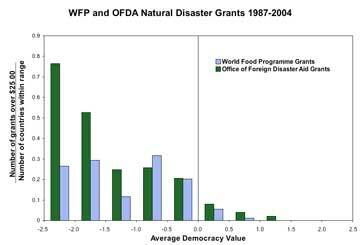 The majority of both World Food Programme and OFDA aid grants are received by nations with negative democracy scores. Grant numbers are corrected for the number of countries that fall into each democracy category, so the observed decrease cannot simply be explained by the larger number of less democratic countries. Taken together, data from the OFDA and the World Food Programme further enforce the previous finding that nations with low-levels of democratic rule are more likely to suffer severe humanitarian consequences from natural disasters. The spread of democracy over the last several decades may therefore partially explain why the total number of deaths associated with natural disasters is decreasing despite the increase in the number of events. Amartya Sen discovered that famines are distinctly non-natural phenomena. Certain climatic conditions, such as droughts, make famines more likely, but they are not the inevitable consequence of environmental circumstances. States and their citizens have the power to prevent, or bring about, as it may be, a famine — and likely other disasters. If famines are almost entirely within the control of governments and citizens, how are we to understand what are collectively referred to as “natural disasters”? Such events as earthquakes, windstorms (hurricanes, typhoons, cyclones and tornadoes), landslides, volcanic eruptions, floods and droughts are referred to as “natural,” implying that they are beyond the sphere of human influence and agency. But are they really? No state or society can prevent the occurrence of an event such as a hurricane or an earthquake. That is beyond the range of human capability. But one can not argue that disasters are wholly independent of human action. After all, a disaster is only a disaster if it affects humans themselves. That is, any natural disaster is the intersection of a natural event and a human population. But if we cannot prevent the event itself, we can certainly influence — reduce or exacerbate, depending on the circumstances — the impact of the immutable event. Asked in another way, do certain characteristics of any given society or state predispose it to a greater impact or enable it to reduce the impact from natural disasters than states lacking or possessing in smaller or larger amounts those characteristics? And how is one to quantify the impact of a disaster: Should it be measured in terms of lives lost (humanitarian) or money spent (economic) or some combination of the two? Are the incentives for a state to respond in a certain manner moral, societal or financial? If the impact of natural disasters in humanitarian and economic terms is not solely natural, then there exists a clear opportunity for societies and communities at all scales, from familial to global, to influence the impact. We have to capitalize upon this remarkable opportunity to effect change, ensuring that the influence is a positive one and that more lives are saved and not lost. Vulnerability to natural hazards includes not only the risk of an event — the risk involves both the probability of occurrence and how much infrastructure, both societal and economic, is exposed — but also the resiliency of the infrastructure and the national capacity to respond. Governments with low levels of accountability to their citizens may feel less pressure to maintain a high-level capacity for response to the humanitarian impact of natural disasters. Even if a nation has a comparatively low level of accountability to its own citizens, it may still have a high level of accountability to the global community. If individual nations become accountable for many of the deaths that occur within their borders in the aftermath of a disaster, a strong international incentive (pressure from the world community) may take the place of accountability through democratic rule. Advances in global communications and economic interdependency may now be making all governments accountable to global citizenry. Deaths from natural disasters can no longer be dismissed as random acts of nature. They are a direct and inevitable consequence of high-risk land use and the failures of governments to adapt or respond to such known risks. If so, then perhaps the most important and possibly least expensive methods for reducing the humanitarian impact of natural hazards is to increase the transparency of risk, improve global awareness of the consequences of high-risk land use and hold accountable governments that place their populace in harm’s way without a capacity to respond. While the number of natural disasters worldwide is increasing, the number of deaths associated with natural disasters is decreasing. For the purpose of this analysis, we restrict the use of “natural disaster” to droughts, earthquakes, floods, landslides, volcanoes, wave/surges, wildfires and wind storms (including hurricanes, cyclones, typhoons, tornadoes and winter storms). Natural disaster data is from the Emergency Disaster Database (EM-DAT), maintained by the World Health Organization’s Collaborating Centre for Research on the Epidemiology of Disasters. The disaster value plot­ted is the annual total of EM-DAT-recorded di­sasters from 1964 to 2004. The normalized global disaster death plotted is the number of EM-DAT-recorded disaster deaths divided by the annual global population values provided by the World Bank’s World Development Indicators. Countries that have suffered the greatest loss of life from natural disasters are those with low democracy indices and low gross domestic products (GDP). The impact, abbreviated as DPE, is measured by total deaths divided by total events normalized to population per country. The linear trend is due to the strong correlation between democracy and GDP. Each dot (133) represents a nation. Each country’s normalized death toll was determined by dividing the total disaster deaths from 1964 through 2004 by the average national population value, determined from World Development Indicators (WDI) population data for that time period. The Death per Event (DPE) plotted is the normalized death toll divided by the total number of disasters experienced by a country from 1964 through 2004. The size of each dot is proportional to the number of deaths per event as normalized to the country’s population at the time of the event. 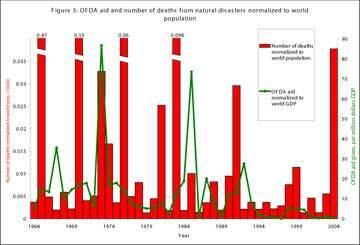 U.S. aid provided by the Office of Foreign Disaster Aid (OFDA) (green line) is generally responsive (with slight time-delay due to reporting dates) to the humanitarian impact of disasters, especially since 1981. The spike in 2004 is the Indian Ocean tsunami in December of that year. OFDA aid for that event was not recorded until the next year, so it is not included on the figure. Mortality was plotted as the global number of deaths per 1,000 people (thus normalizing for population growth). Aid was plotted as dollars (2004 adjusted) given per million dollars of world GDP (thus normalizing for economic growth). Death data was retrieved from EM-DAT database. Aid data retrieved from 1964 to 2004 OFDA database. Most U.S. Office of Foreign Disaster Aid and U.N. World Food Programme disaster relief grants go to countries with low democracy values. Each country was assigned a democracy value according to the average value of its six World Bank indicators at the time of the received grant. Each individual aid grant from 1987 to 2004 was then assigned a category depending on the democratic value of the recipient country at the time of the grant. The normalized number of grants plotted is the number of grants in each category divided by the number of countries that fall into that category. Van der Vink teaches courses on environmental science and natural hazards in the Department of Geosciences at Princeton University in New Jersey. His co-authors are Peter DiFiore, Andy Brett, Edward Burgess, Jacalyn Sproat, Heather van der Hoop, Pamela Walsh, Ali Warren, Logan West, Daphne Tess Cecil-Cockwell, Alain Chicoine, Jevon Harding, Christian Millian, Elena Olivi, Sara Piaskowy and Grace Wright. The authors would like to acknowledge the World Bank and the Office of U.S. Foreign Disaster Assistance for making their data available for this study. They further acknowledge the Department of Geosciences, Princeton University for their support of this project.